Over the course of 2013, National Bank Direct Brokerage (NBDB) made a number of upgrades to its websites (mobile and main website), pricing, customer experience and recently opened a ‘do-it-yourself investor’ zone in downtown Montréal. In addition to the numerous upgrades and initiatives, they were also the recipients of the 2013 J.D. Power Award for Investor Satisfaction among Canadian discount brokerages. As they are a bank-owned online brokerage, National Bank Direct Brokerage (NBDB) offers the convenience of branch services as well as being able to manage other National Bank financial products with via the standard National Bank online interface.Like their peers, National Bank Direct Brokerage offers online trading in stocks, ETFs, mutual funds and bonds. Early in 2014, National Bank Direct Brokerage lowered their standard commission fees to $9.95. Now that NBDB has updated their pricing, what a trade commission costs with NBDB depends on the activity level of the client. The standard equity trade commission at National Bank Direct Brokerage is $9.95 for all clients regardless of account balance. For active traders (defined as those who trade at least 30 times per quarter) commission rates range between $6.95 per equity trade and $9.95 per trade. What active traders pay depends on the price of the share, with shares at $2.00 or less being charged 0.05% of the value of the transaction (to a maximum of $9.95/trade) and shares of $2.01 or more being charged at $0.01/share (to a maximum of $9.95/trade). An important consideration for potential NBDB clients is the inactivity/administration fees. At the end of 2013, NBDB revised their administrative fees such that individuals with at least $20,000 in combined assets by May 31st of a given year or who make at least 5 commission-generating transactions (e.g. stock, ETF or options trading) between June 1st and May 31st can have their inactivity fees waived. For those who do not meet these criteria, an annual fee of $100 is charged. The product offering from NBDB includes registered and non-registered accounts in which clients can trade Canadian and US stocks, ETFs, mutual funds, bonds and options. The registered accounts offered include tax-free savings accounts (TFSAs), registered retirement savings plans (RRSPs) and registered education savings plans (RESPs). At the time of writing, there are also plans to roll out US dollar versions of the registered accounts. For the moment, these registered accounts can accept deposits in USD and clients can trade (and hold) USD equities, however withdrawals from the account will result in a currency conversion back into CAD. As with other brokerages, margin cannot be used with registered accounts. Options trading in registered accounts is limited to buying and selling options as well as covered calls. In the non-registered investment account category, clients can trade with cash and margin accounts. For clients who would like to “short sell” stocks, a margin account with short selling is required. 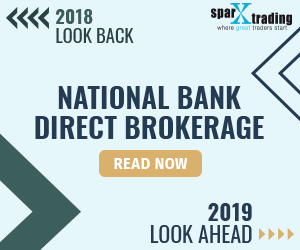 National Bank Direct Brokerage has platforms geared towards longer term investors as well as active traders. Their standard (or “Classic”) platform is similar to most online trading platforms offered by discount brokerages. For active traders, NBDB offers Market Q (this is from Interactive Data the same company that owns eSignal) to track stocks and to conduct advanced technical analysis. As it is built off a similar platform to eSignal, the charting and sophistication of data available is robust. While order entry is possible from within Market Q, monitoring open positions as well as win/loss and other trading stats is not. The data feed for Market Q ranges from Level I (real time information on most major North American markets) to Level IV (market depth on TSX-V). Pricing for data for Market Q depends on a client’s activity level. Pricing for Level I quotes starts at $39/month and can go to $148/month for Level 4, for individuals trading between 0-9 trades per month. For those clients trading 100+ trades per month, Market Q data fees are waived. More information about data pricing and trading level discounts is available on the NBDB website. Finally, National Bank Direct Brokerage also offers a mobile website which can be accessed by most mobile browsers. The essential functionality required for placing an order, managing funds and tracking order status can be conducted via the mobile website. Click the following link for our in-depth review of National Bank Direct Brokerage’s mobile website. This topic contains 13 replies, has 2 voices, and was last updated by freeEtf 1 week, 1 day ago. National Bank Direct Brokerage provides free ETF trading not only for Canadian ETF but also US ETF. Why no other people mention that? By far one of the worst brokerages to deal with. I’ve traded with almost every brokerage in Canada. Horrible customer service. Constant outages on their website. Customer service hours are not ideal unless you live back East. Had their system crash on my several times causing me to miss trades with no compensation or acknowledgement of their mistakes. Much better firms to choose. They had a tempting offer initially to transfer my accts over, but ended costing me much more in missed trades. Reading the reviews above, it appears not much has changed to rectify their issues. The website problems are chronic and continue to cost me opportunities and money. I am researching other platforms to move. I am so unhappy with the service of this trading platform! It keeps going down and it’s so slow… 2 weeks ago it was down for 3 consecutive days! Today it’s down and i am here to rate it down! Add to it the non accurate information on their website! like Falsely reporting a CEO of a company selling 75% of his shares! The worst online trading site. Slow, insecure, every other day you will see the message saying sorry for inconvenience. I lost a lot because fraction of second is very important in online trading. I will transfer my money to other banks. Nbc need to invest a lot on improving the site. While agree outages are a risk there has been constant login trouble followed by a complete outage. My trading here was exactly 3 weeks, in which I did 8 trades, This is a second account I have valued around 90k. They stalled the paperwork for a week ( and tried to deny the promotional offer so off to bad start) Transfer was quick starting in 10 days plus and extra three for the complete account including in kind stocks. I have only charged brokers twice the first was to Questrade to stop the forced conversions Etrade charged. Customer service when offering you something refuses to put it in writing means to me they can’t be trusted. Sorry to drag your site down with this review but this was my experience with them, I could very well be the exception. Thanks for your comment Brian. Outages are always a frustrating (and possibly costly) scenario to face when trading online. Unfortunately there are cases (speaking from personal experience at other brokerages too) where connectivity cuts out so it seems like no brokerage is immune to them. That said, the more time one spends in the markets or trading through the day, the more chances there are of being impacted by intermittent outages. As for the client service reps – that sounds tough. It’s usually prudent to get things in writing when conducting any transaction or making a special arrangement – did the reps give you a reason why they did not put what you were asking for in writing? Hope things improve the next go around. I will be transferring out after only 1.5 months. Website outages are ongoing (and costly in my case) Representatives who lie and won’t but anything in writing when asked. If asked my advice we would be to not use this broker at all but I’m only one person.